A garden, no matter what size, is truly a benefit! Since most homeowners aren't blessed with large living quarters, nor a commercial-sized garden, it is imperative to fully utilize every aspect of your smaller garden so it can become a fully-functioning space that can provide a substantial amount for you and your family. 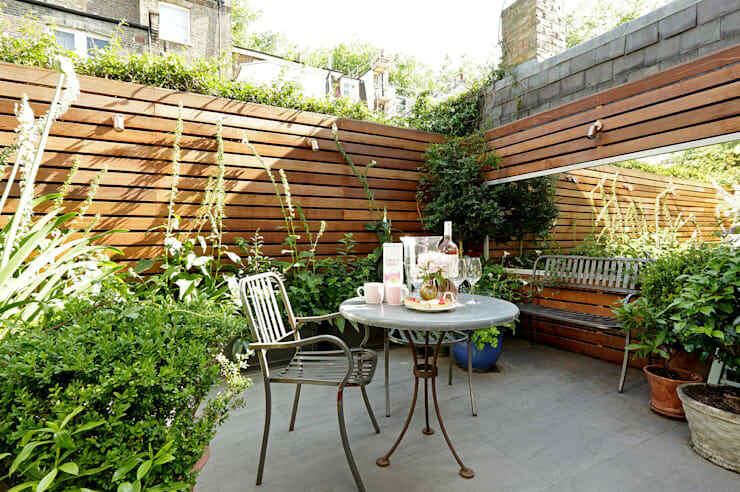 Making the most out of your small garden is the idea behind each of these suggestions and whereas as most are cost-effective, they will indeed be a good amount of work. Any outdoor work is multiplied in your efforts because of climate and temperature of your area! Whether you're craving more privacy, a new aesthetic, or simply a new way to plant your favourite plants and herbs—we've got you covered! Choosing the right fence for your small garden is necessary for more privacy and making sure the look is just right. With smaller gardens you have to be careful about the fencing you choose, as it could make the space seem even smaller—and worst of all, take away proper space for adding more plants, herbs and vegetables! What does one do when they're limited on legroom and floor space? Try vertical gardening! There are plenty of companies that understand your small garden needs and have produced potted planters and vertical systems to aide you in planting up and out! Another way to properly add to your vertical garden is to simply buy taller, wider plants and trees! These items don't have to be just for looks either—maybe invest in a few bamboo trees, as they only take five years to hit maximum growth! Invest in gardening twine or strings to allow your plants to grow to specific areas of your garden and if you do this with the right kinds of vine—the end result can be stunning and beautiful—while perhaps even adding privacy. 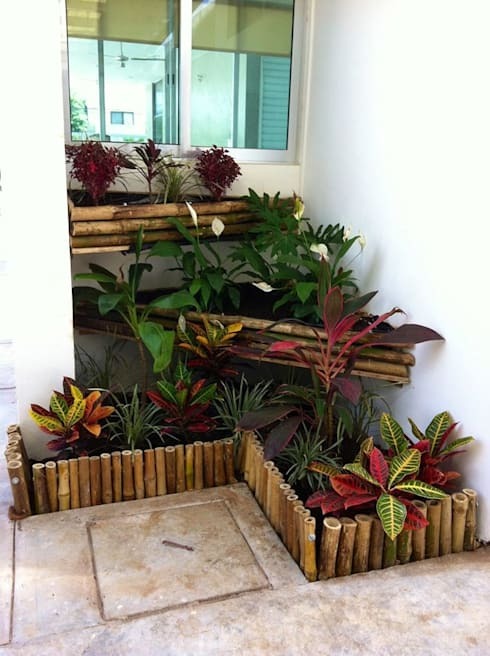 For an idea of how vertical garden can create a (beautiful) sense of privacy, check this out! As small gardens lack on the obvious—space—utilizing vertical gardening and differentiating heights with planters and soil transfer are of paramount benefits to you as a homeowner. One of the most important things to consider when using vertical planters and shelving systems is to make sure you have proper drainage intact! Especially if you are attaching planters directly to your home, as seen here—make sure the drainage won't ruin the exterior walls of your home or drain down into the foundation causing serious damage! Adding height difference in your small garden will add a sense of drama and if the the right plants are chosen, can being to produce a plethora of fresh fruits, vegetables and herbs. Tip: Add planters of different heights into unused corner spaces! Most of us dream of having a secret garden-type of situation with open and winding paths to each corner of our backyard and garden space—however, this is usually not possible. 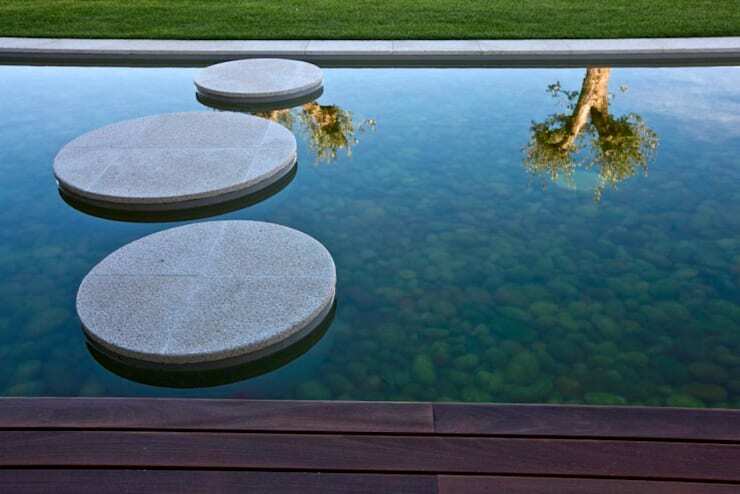 Utilize small stones as a way to create both great drainage in your garden and provide paths for either minimal walking or water flow. Go to your local raw stone distributor or quarry and ask the professionals for some advice. As small stones can come in a variety of textures, colours, shapes and sizes—it is important to understand what will work best for both the look of your garden and the function! 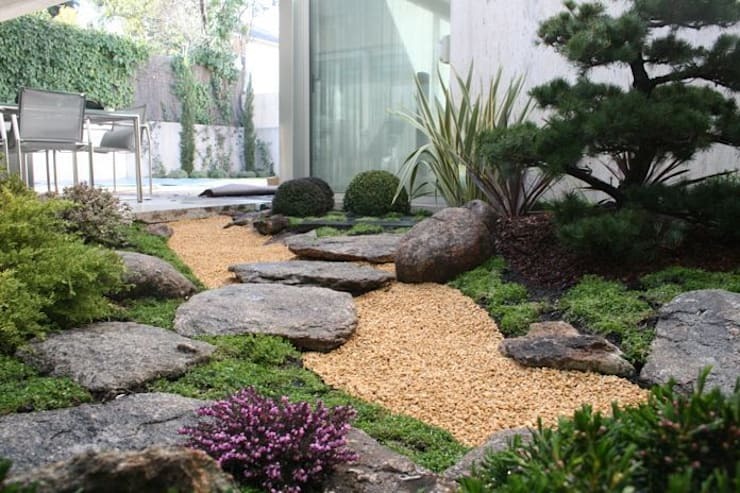 To see how smaller stones and mulch can work together, check out this great example! Most people assume that adding bold colours to a small space would create the illusion of even less space, or make it seem overcrowded—but let us tell you, this is not true! 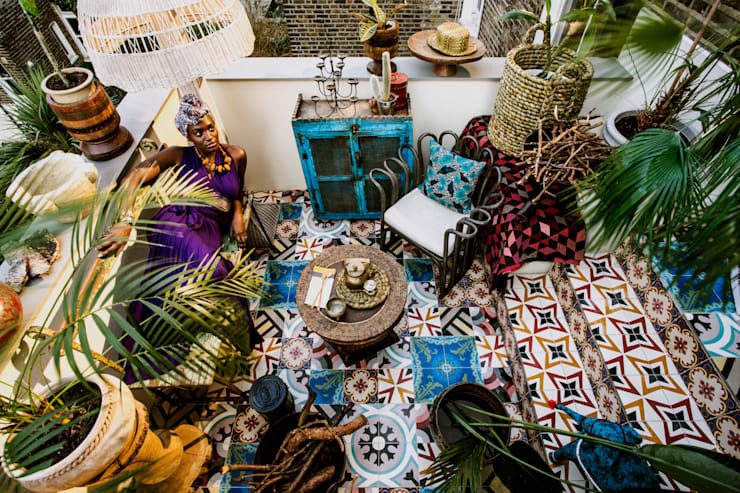 Using bold colours through furnishings, decor and especially wall or floor tiles will create a sense of depth and added space as it will create a strong sense of visual stimulation for both you and your guests. Check out this example and how the homeowner used GREAT tile design (that even continues on the stairs, which adds depth), a mix of bold pillows and accessories, as well as furniture and large, dramatic planting pots! This balcony, in reality, is quite small—but upon first glance at this photograph it is a space all its own! Of course, your garden will need to be functional! If you do any sort of entertaining, cooking, grilling or gardening—then you will definitely need storage space! Storage space never has to be an eyesore in an otherwise beautiful, natural environment! Opt for vertical storage systems and shelving systems (pictured here) for ideas on how you can use multiple types of storage. Shelves are great for exposed storage—in case you need easy access to what you're placing on them, like wood and crates for holding various textiles. For smaller items like cooking utensils and gardening tools, consider hook systems for easy access and cleanliness. For wall storage—take a look at this! Last but not least, add a water feature to your small garden. Water features aren't just for the larger gardens and backyard spaces—their variation and reflective qualities are actually perfect for small gardens! Discuss your ideas with a professional to gather your thoughts on your options both functionally and stylistically. If your garden is very small, then this could definitely be a DIY project to be completed in one weekend or so! Make sure with water that you're using proper drainage and adding proper small and large stones for just the perfect look! However, don't add too many decorations as the small space would look too cluttered—let the water feature speak for itself! Have you properly utilized your small garden? Tell us how by commenting below!